(April 10, 2017) -- Why do you love UTSA? There's a lot to love – the classes, the professors, the laboratories, the programs, the campus. 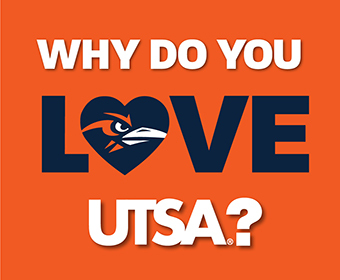 You have until midnight to share it by getting involved in this month's I Love UTSA Campaign. Launched and coordinated by the UTSA Office of Annual Giving, The I Love UTSA Campaign provides the community with an opportunity to support UTSA's top-tier academic, research and outreach programs. Eight colleges are participating this year: the College of Architecture, Construction and Planning; College of Business; College of Education and Human Development; College of Engineering; College of Liberal and Fine Arts; College of Public Policy; College of Sciences; and the Honors College. UTSA Student Affairs and UTSA Libraries are additions this year. "Student success is the face of this campaign," said Heather Green, UTSA director of Annual Giving. "We want UTSA students, faculty, staff and alumni sharing what they love about UTSA with the hope that it inspires them to give back." UTSA students, faculty, staff, alumni and the community are encouraged to go to the UTSA Giving Facebook, Twitter and Instagram channels and share what they love about UTSA using the hashtags #ILoveUTSA and #UTSA. They can show their support by giving on UTSA's crowdfunding website, Launch UTSA. UTSA fundraising priorities range from raising support for student scholarships, fellowships and leadership programs to raising funds for laboratory equipment and community outreach programs. "These funds allow the university to address emerging opportunities and use the money where it is needed most to help students succeed," said Green. To give to UTSA, visit fund.utsa.edu. For more information about the I Love UTSA Campaign or fundraising at UTSA, contact Heather Green at 210-458-5155 or heather.green@utsa.edu.